It seems right to begin with disclosing that this is a "seconds" knife. No doubt if I were reading a review and the product wasn't up to the owner's expectations in ways that could be explained by the fact that it was a seconds product, I'd ignore the review and move on. The problems with the A.G. Russell Skorpion go far beyond a few cosmetic blemishes. In fact, my knife has very few of them and nothing more significant than I would put on it myself in a week or two of use. I think that perhaps I could have returned my Skorpion and got my money back, but I was conflicted the day I got it and started examining it. I wanted to give it a chance by taking it apart, cleaning it up and tweaking it to an acceptable state. What's more is, I like it. I like the way it looks. I love the design and the proportions. I wanted to make it work. That's when the trouble started. 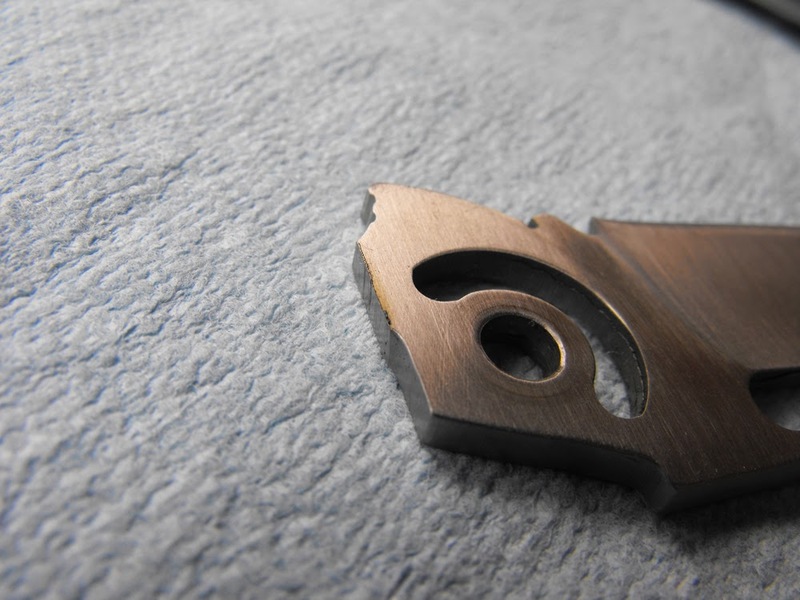 I don't know if I've expressed this opinion in my previous posts, but I cannot stand the abusive application of thread locker on knives. Just leave it off. For one thing it's not necessary, for another thing they appear to be using the red compound given the red tint to it when I remove it. But for all I know it could be super glue and in the case of the Skorpion it certainly seemed like it might as well have been. Even with a small torch the nasty goo wouldn't let go in places where it was far beyond liberally applied. All of the screws were basically just like this - some worse than others. 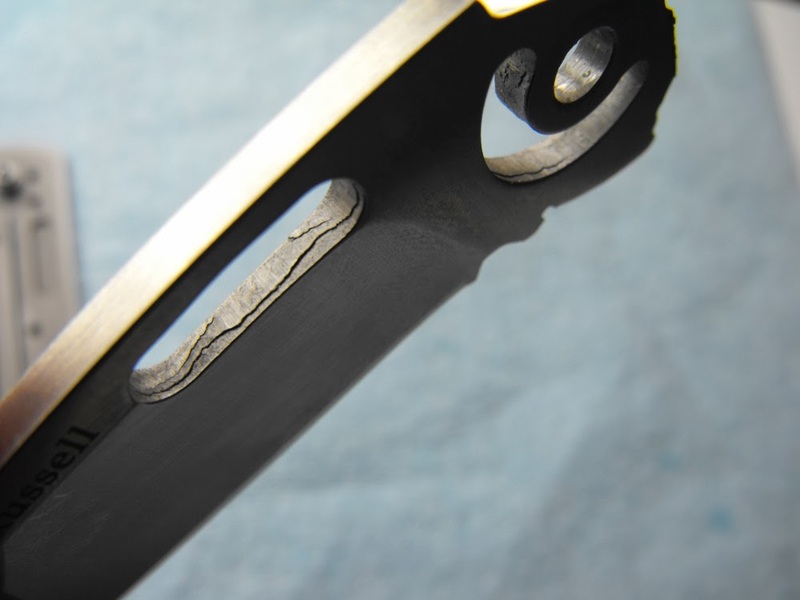 Virtually every screw on the knife had been damaged at the factory. 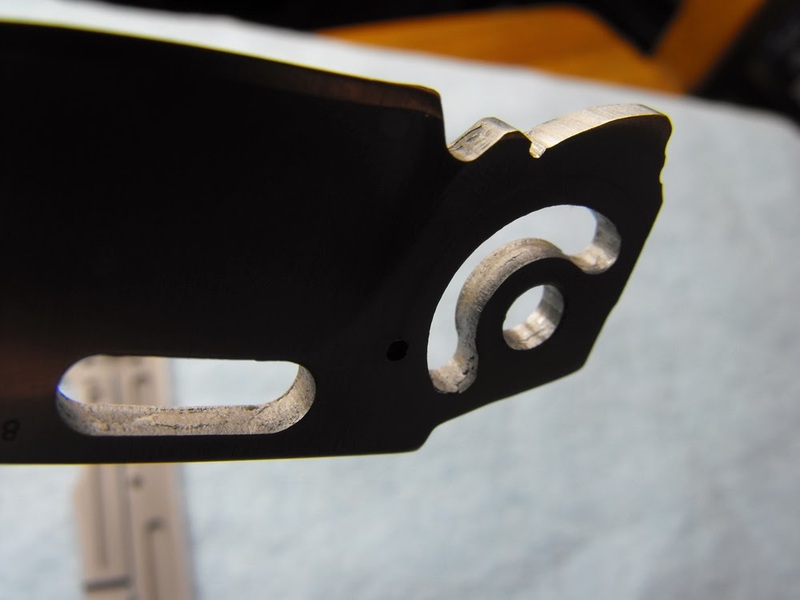 The Torx-style sockets are off-centered and each of them marred by sloppy assembly. 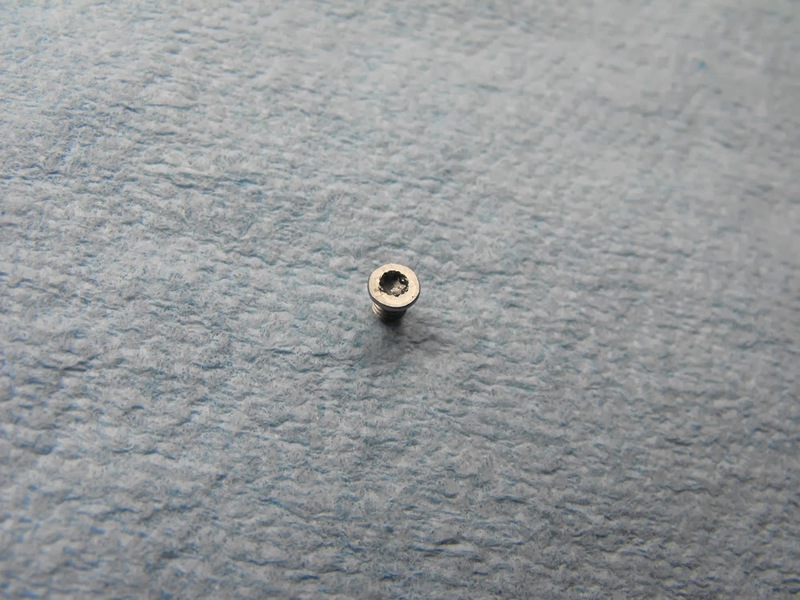 Most of the screw heads sit off to one side or the other in their respective countersink and overall create a cheap appearance. The screw holding the lock bar over-travel stop was destroyed and conveniently covered up by the pocket clip. Lock Bar Over-Travel Stop screw out of the box - no thread locker thankfully. The pocket clip screws are the same size and the extra clip came with spares so luckily I have a good screw to replace this one. What amazes me is that the handles and blade look pretty good. My particular unit could have been given fresh screws (without loctite) and sold as a true second quality product and I would have been writing a more positive review - though not entirely positive. It probably would have cost pennies and seconds to make this knife functional at the factory. Out of the box the blade nearly touches one of the handle slabs and requires a good snap of the wrist to fully deploy. It was gritty, stiff opening, and essentially unacceptable for use as it arrived. The lock up is almost too late and very sticky to unlock. This is the biggest problem because it could potentially render the knife useless if it cannot be remedied or gets to be unsafe. With any luck I can square the Skorpion up enough that the lock-up improves. Bottom line here is that blemishes are one thing, a non-functioning product is another entirely. Luckily the tolerances aren't so good that these rough surfaces do much grinding. I doubt they help though. Some might be saying, that's what happens with those Chinese knives. I disagree. I have a handful of overseas Kershaw and CRKT knives, plus the Ontario RAT 1 and Boker Titan that have all been pocket ready right out of the box. No destroyed screws, perfectly smooth deployment and acceptable overall fit and finish to go directly into my rotation. Burrs from machining on the lock face. And that brings me to the big A.G. Russell Skorpion problem. It simply isn't worth what it costs. In flawless condition this is a $40 knife that A.G. gets $75 for. We can call the mostly gimmicky machining in the handles a minor value adder but in my opinion that only gets it to the $40 mark. I bought the knife in hopes that there had to be some kind of value boost somewhere in it. Like it would be silky smooth opening, or there would be a little extra attention to detail all around. Wrong. It has plastic washers and a simple "internal" stop pin. No extra or fancy looking pillars, nothing. It does come with an extra pocket clip. I guess that clip must be worth about thirty bucks. There are a few design missteps that I didn't notice until I held it but they seriously hurt the review because for the money, every detail should have been considered, and they weren't. 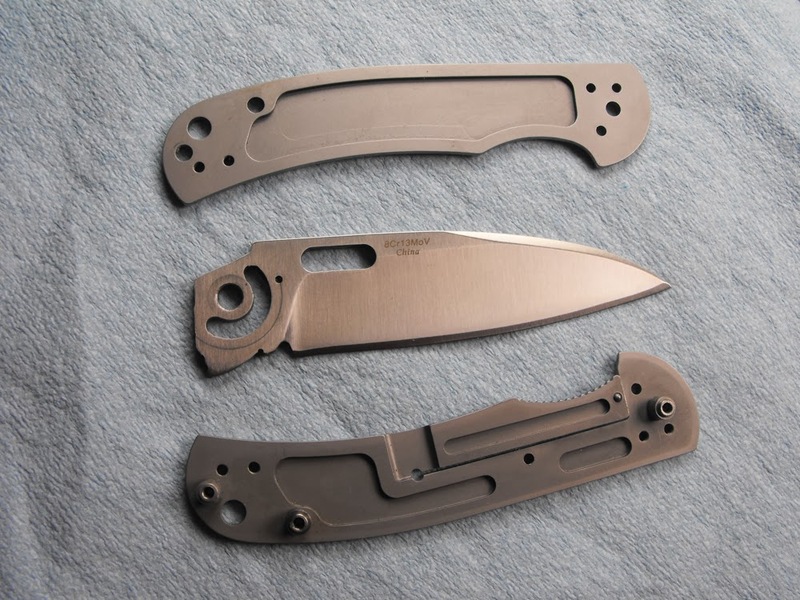 With major value adders available for significantly less money like the ball bearing pivot in the CRKT knives, the Kershaw Cryo and all its features like assisted opening, and solid reputation for consistently being amazing, or the American made Buck Vantage line with better steel, it is very hard to recommend the essentially featureless A.G. Russell Skorpion in flawless condition for the price. For $75 it should be American made and assembled correctly. A second quality unit should function like a first quality and cosmetic blemishes could include marred screws or scratches, but an unfinished, poorly assembled product shouldn't have even been acceptable to A.G.Russell for sale at all. 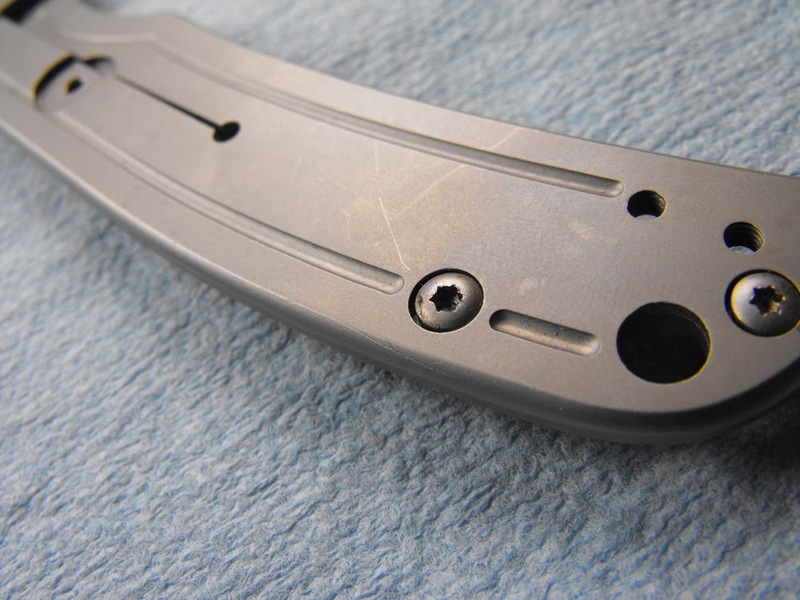 Some of those design missteps are the holes for the blade stop pin, the pivot itself and the pocket clip location. When I fix my Skorpion I will get some pics up but I was too impatient to get any before I took it apart. But you can see what I'm saying with the pics above. The stop pin holes go entirely through the handle. Why? It should be hidden. The pivot is actually a standoff or pillar just like the others found in the handle. How much adjustment are we going to get from that? Very little if any I think. The pocket clip took some thought, but it doesn't belong where it attaches. The head of one screw is partially under it so it doesn't sit flush to the handle. It could have been right, it just isn't. These design flaws are the nail in the coffin for me. Not recommended. Click for the final review.